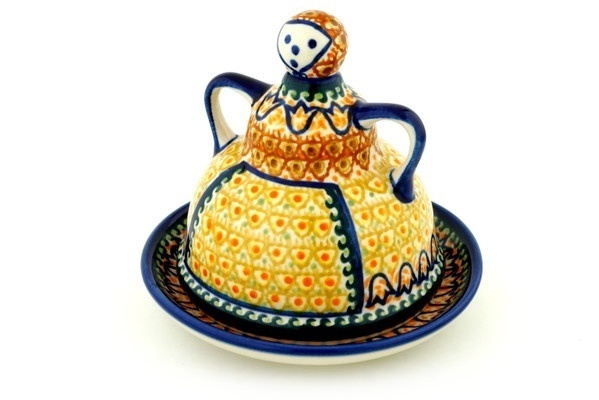 The wife of one of my coworkers organized a shopping trip to Boleslawiec, Poland specifically to buy Polish Pottery. Kacey and I thought it sounded like fun, so we signed up. The plan was to meet up late at night, let the bus drive overnight so that we arrive at the destination just as the stores are opening. But I had no idea how hard-core our traveling companions were going to be. To give you an idea how seriously they were taking this trip: The 50 passenger tour bus sold out every seat, but only had 26 people on it...because everyone else bought two seats. Why two seats? One for the shopper and one to hold all the additional pottery that wouldn't fit in the cargo compartment under the bus. I was also the only guy on the bus. Seriously? Yes. I was the man. Our first impression of Poland was influenced by our arrival at the German-Polish border. Even though it was probably coincidence (and considering that it was the dead of winter, it really should have been expected), it started snowing right when we passed the "Welcome to Poland" sign. Imagine passing across the border and watching the green meadows of Germany instantly become what looked like a barren white wasteland. That definitely added to the somberness of the remaining road trip. We got schooled up real fast on the different grades of Polish pottery, and the brief version is that "Unikat" are the best ones to get. They come in all different patterns, but my personal favorite is #117. We bought this bowl in the pattern, partially because I think it looks festive enough to also serve salsa in. We also lucked out and found what we call "Pancake Ladies" in this pattern. It's actually called a "Cheese Lady"﻿ but we use it to keep our pancakes warm. There was only one store stocking the lady in the pattern we wanted, and I found it in one of the last stores we stopped at (there were so many stores that I lost count). And sure enough, that bus was packed to the brim with pottery on the return trip. Boxes down below, boxes in the 'empty' seats, boxes in the aisle. I think some folks actually purchased place settings for 12 people. I can see why people did that, since it's much cheaper picking it up from the store than ordering/shipping it. Even though we didn't buy that much stuff, it was a very fun trip and I highly recommend going if you get the chance.